To honor our 50th anniversary, we invite you to peek into our archives each month. This month, we commemorate Hanukkah and the Soviet Jewry Movement. Description: Photograph of a group from Arlington Fairfax Jewish Congregation celebrating Hanukkah at the daily vigil for Soviet Jewry, 1973. Photograph by Ida Jervis. 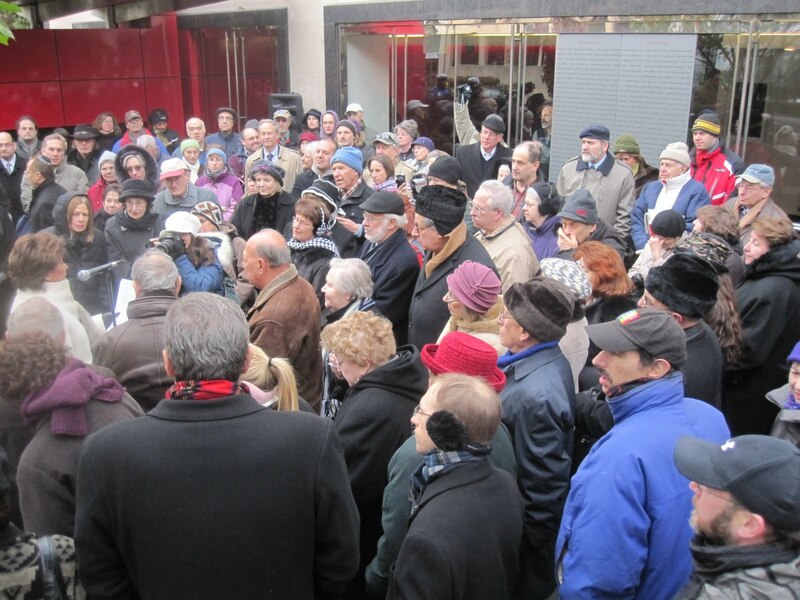 Background: In 1970, protesting on behalf of Soviet Jews who were denied permission to emigrate from the Soviet Union, Washington Jews started a daily vigil across the street from the Soviet Embassy on 16th Street, NW. Local synagogues and Jewish organizations were assigned specific days to ensure daily attendance. The vigil was maintained until 1991 when Soviet policies began changing and Jews were permitted to emigrate. The vigil was the most acclaimed of Washington’s Soviet Jewry activities. The Soviet Jewry movement (c. 1963-1991) was a worldwide effort to free Soviet Jews, who were unable to emigrate or practice Judaism without persecution or discrimination. Across the United States, grassroots groups sprang up to work on behalf of these disenfranchised people. Washington’s Jewish community organized and participated in rallies, demonstrations, and other protest activities. Washington-area activists came together again a few years ago when they partnered with the Jewish Historical Society to discuss how to ensure the community’s contribution to the Soviet Jewry movement would be documented for posterity. The first meeting resulted in a new collection in the Society’s archives of more than 20 written or recorded memoirs of movement activists, more than 50 photographs, political buttons (such as the one seen at left), t-shirts, organizational records, and Prisoner of Conscience bracelets. 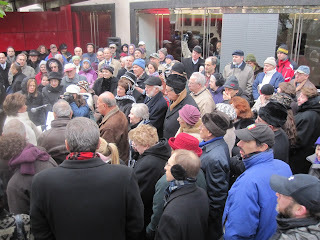 On December 10, 2010, the community gathered across the street from the former site of Soviet Embassy to commemorate the 40th anniversary of the start of the daily vigil. This event kicked off the beginning of a Society project, which includes creating a new exhibition and public programs to highlight the efforts of the local community on behalf of the Soviet Jews.